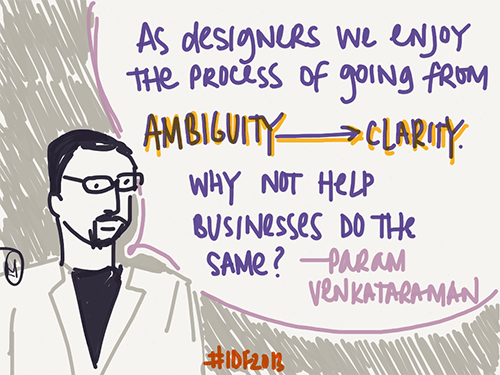 This past March, Mumbai hosted the second India Design Forum. 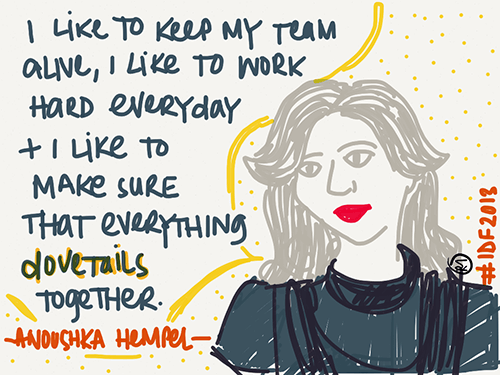 A gathering of the who’s who of the design world, the two-day event was a packed schedule of speakers and panels, all against the backdrop of a city-wide design week. A number of local studios and design entrepreneurs participated in the daily events leading up to the forum and were all centered around the theme of “Design Matters”. 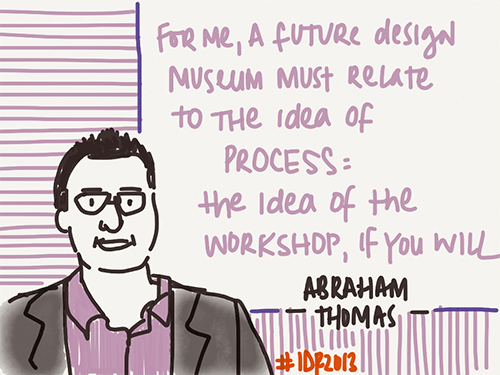 Here is a selection of sketchnotes tweeted drawn and tweeted live from the NCPA over the course of these two days. We’re quite late in posting these to the website. Nonetheless, we hope they provide a snapshot of the day’s conversations in light of certain themes that emerged in the course of the forum. 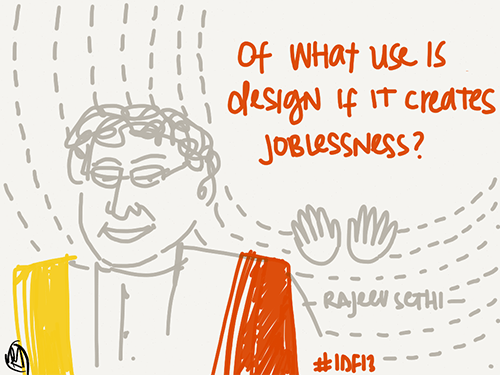 The opening note of the second India Design Forum was lead by the charismatic designer-philosopher Rajeev Sethi. A champion of Indian arts and crafts, his passioned address asked a pivotal question about contemporary design practice which, instead of building on the skills and strengths of the craftsman, relies on mechanical means of design production that create unemployment for the country’s creatively skilled makers. 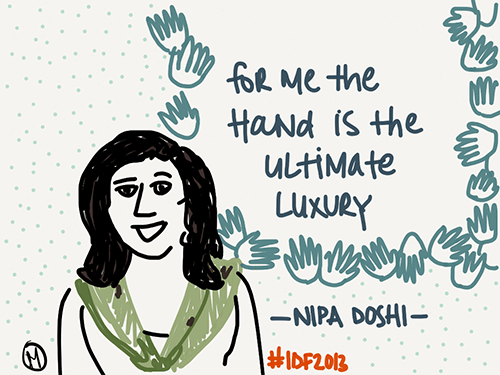 Presenting as one half of design duo Doshi-Levien, Nipa Doshi offered a rare peak into the studio’s process with sketches and prototypes that lead into final products. Known for an approach that blends European and Indian motifs, she spoke of their collaborations with international brands emphasizing the draw of Indian skills in working by hand. Luxury, however, is clearly the domain of Anoushka Hempel Design. The elegant creator of this eponymous brand of architecture, interiors, retail, residential spaces and yachts, spoke of the inspirations in her work, her love for life and her demanding attention to detail. 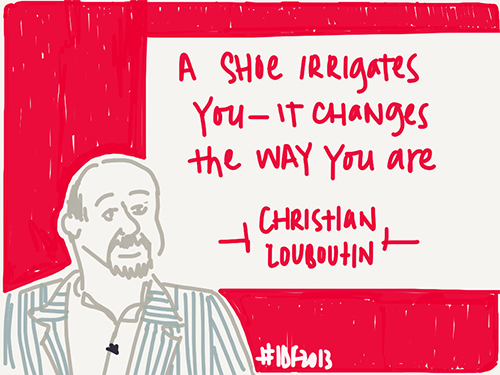 While to some the idea of luxury lies in process and to others in the sensory experience, to master shoe designer Christian Louboutin described his fascination with the way a pair of shoes can transform someone’s personality. Being in contact with a beautiful object can be a psychological experience as well. As the creator of some of the world’s most coveted footwear, I imagine he knows a thing or two about it. But luxury is a rather different concept when it comes to fashion designer Sabyasachi Mukherjee. For over a decade now, he has challenged borrowed notions of high fashion with his unique take on traditional Indian silhouettes, fabrics and surfaces. In some ways, he offers an answer to the challenge posed by Rajeev Sethi: of design that brings traditional knowledge into the present, embracing it and making it a part of the process. 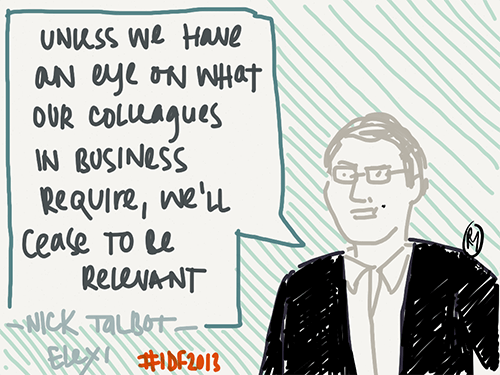 …and Nick Talbot, Head of Design and Innovation at Tata Elexsi both of whom suggested the need for designers to understand the needs of the corporate world, and to learn its language. 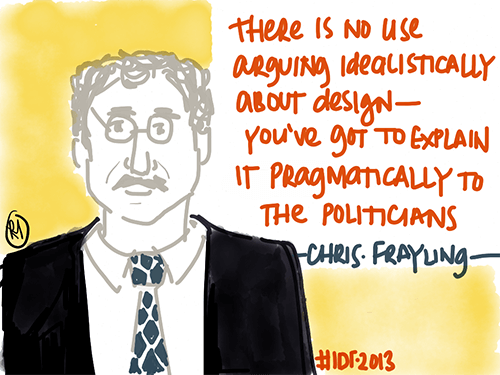 On the topic of Building Design Institutions, former rector of the Royal College of Art, Sir Christopher Frayling pointed out the need for the creative industries to make a solid case for design to policymakers. 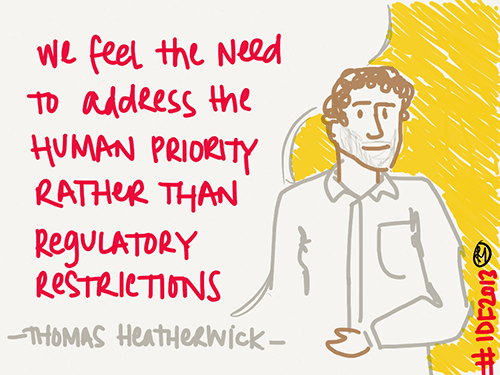 It was a delight to hear architect Thomas Heatherwick present his work again. The multi-disciplinary nature of his studio‘s work is a testimony to the power of design to create new approaches for government-led projects. From installations for the International Expo to public transport and the Olympics, the studio seems to have little trouble in pushing bureaucratic boundaries on a regular basis. …while designer and former director of the National Institute of Design Vikas Satwalekar felt that creating awareness about design ought to be the first mandate for such an institution. 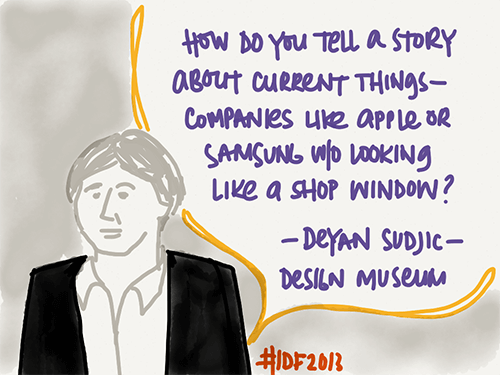 At the same time, Deyan Sudjic, Director of the Design Museum in London talked of the challenges of representing design in a museum environment, particularly when design is often narrowly understood in an object-centric way. To me this highlights a curious intersection of institutions, government, business, luxury markets and the creative process and the way in which these mechanisms are understood vis-a-vis the industry of design. 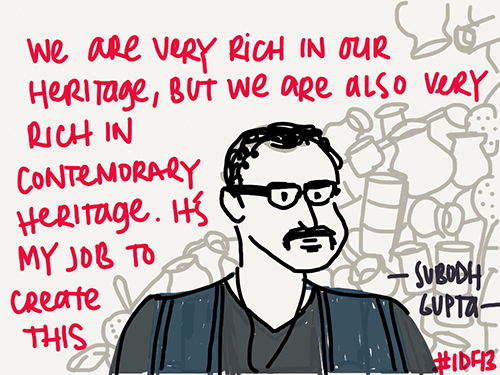 Coming soon after the conversation about museums, artist Subodh Gupta spoke candidly of his Bihari identity and his quest to create art as a form of contemporary heritage. 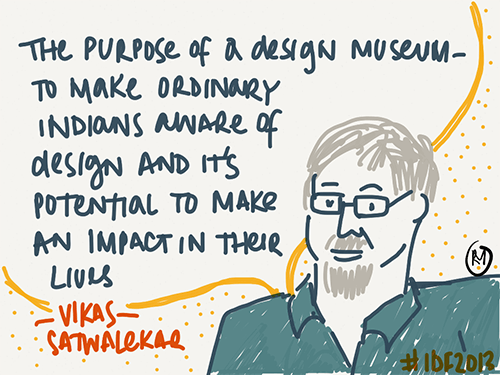 It would have been interesting to have the design museum discussion tackle the notion of design as heritage as well as the complex questions about Indian identity. 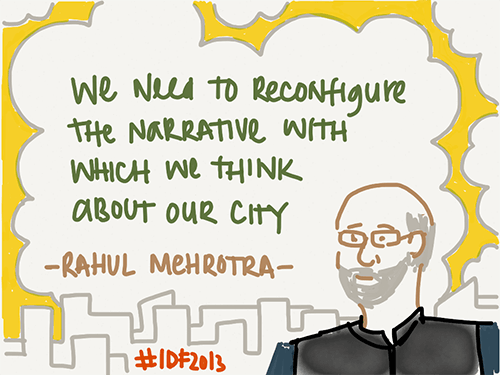 “Identity” in the end was an important aspect of architect Rahul Mehrotra’s presentation – by far the highlight of IDF. He introduced his idea of the Kinetic City – of Mumbai as an ever changing, evolving centre for urban development. In a remarkably rare gesture, he shared his practice’s recent projects spanning a range of forms, answering both broad questions and minute details. 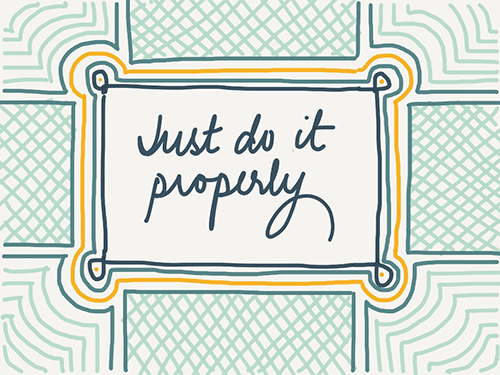 But the journey of an architect or a designer is a difficult one, fraught with challenges. 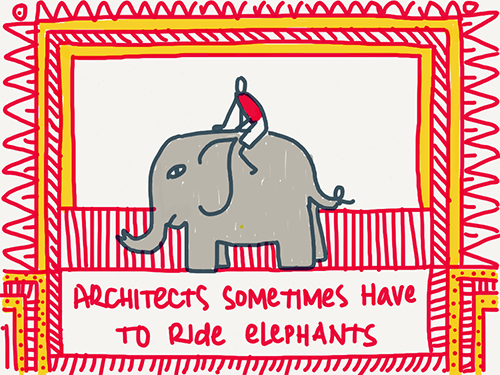 “Sometimes even architects have to ride elephants,” he said, “to understand how to house them”. 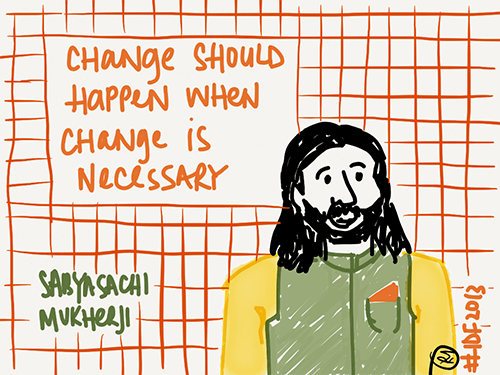 These sketches were created live at the India Design Forum 2013 using the Paper app on an iPad. 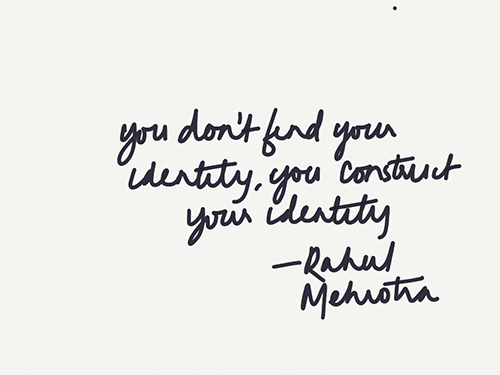 All sketches, text and material are © Ruchita Madhok, 2013 except where indicated otherwise. Please do not distribute in any form or medium without written permission. talk, talk… Talk now when does the work start….good work Ruchita.